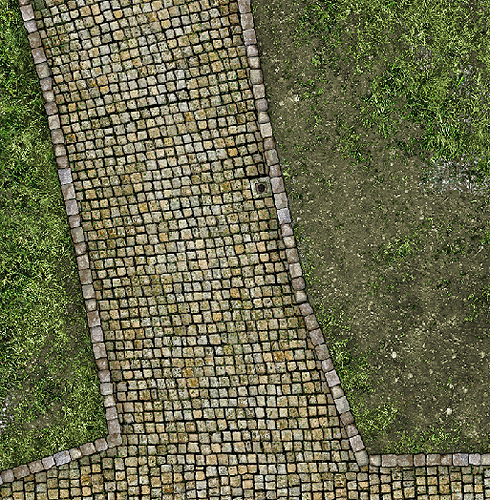 On the workbench right now is a 42" x 60" battle map featuring cobblestone streets. 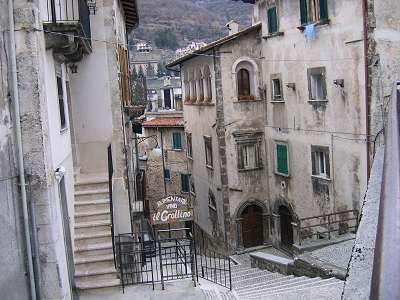 Should be a great platform for creating a town scene with irregular streets, or a battle-torn village full of ruins. This will be a single-layered PDF set. The plan is to offer this as a series of 7" x 10" sections, gridded and ungridded. A guide will be included, and each section numbered, so that you can easily print out only the sections you want. The full-sheet map will probably be offered as well so you can have it printed up in wide format as a single piece. Not sure yet if it's practical to bundle those all together or offer them as separate products, but I'll figure that out later. I love the irregular nature of this. I used Google Maps and picked Belfast, Ireland to scout out an interesting street plan. This bit of real estate is modified from a part of Corn Street. Never been, but it looks okay from space. This looks great! Medieval towns didn't have regular street grids the way modern ones do. Partially because they grew up willy-nilly instead of being planned, and partially as a defensive measure so an attacking force couldn't find their way around if they made it through or over the wall. A few good barricades could make a lot of killing cul-de-sacs. Now i'd need a stone paved, large road (like the ones Romans built), for travels from town to town. .... Partially because they grew up willy-nilly instead of being planned, and partially as a defensive measure so an attacking force couldn't find their way around if they made it through or over the wall. My one request is that it be able to fill a 48" x 48" board. For this, 8"x8" sections would be much more preferable than 7"x10"
It would be really cool if there was some degree of reconfiguration to the streets. Not entirely sure how to do that but it would be very cool. Perhaps instead of making it so every piece matches up with every other piece it could just be designed so each piece would match up with 2 or 3 of the other pieces so it could be reconfigured into a couple different ways. I would be mostly inclined to buy the tiles and an entire package or not at all. Like it had one tile that moved the road from center to the left or right side of a tile, another that made the road wider, one that had a narrow wiggly road, a diagonal road etc.... so that they could be arranged in a variety of permutations to make whatever you wanted. A tile set like that would be cool. Maybe it could be sold in packages. Like one package for roads, one for water, one for craters or ruined ground, another for forest areas etc. Making features 3"x3" and letting people put them together into larger tiles if they wanted or using layers to make a tile that is super configurable would also be very cool. Even cooler would be if I or someone else was willing to brush of some of their programming skills to make a map layout tool that would let you layout a map of the size you choose using a similar tile system and print it out onto tiles of a size selected by the user. In the bottom left of this image you can sort of see what I am talking about. Wish I could have found an image that displayed more of the tile set. 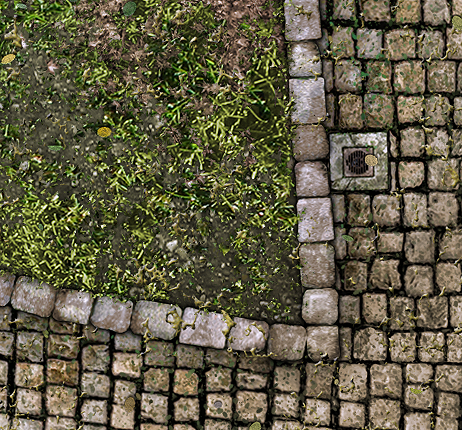 Talking about texture quality in another thread about World Works Games, I just want to say, that your textures, @dave, are superior in my opinion, because of their natural irregularity and organic lines (a must for the Medieval Fantasy genre, I think). E.g. a medieval dock in Himmelveil [?] has regular planks like in an IKEA-decorated luxury flat with nutwood parquette. You can see those dock planks in WWG stuff - without any plank broken or scratched. Great pictures, everybody. Thank you! I'm from California, and I started designing models during a three-month stay in London in 2008. I also visited Spain, France, Poland, the Netherlands and very nearly Belgium (just 500 meters more!). I just fell in love with the old buildings, probably because there's nothing really like them anywhere in the United States. Now i'd need a stone paved, large road (like the ones Romans built), for travels from town to town. Then a river. For other maps, I am thinking about canals, bridges and rivers to mix in with the roads. I'm just starting with something simple so I get used to creating big maps without killing myself on the first try, haha. 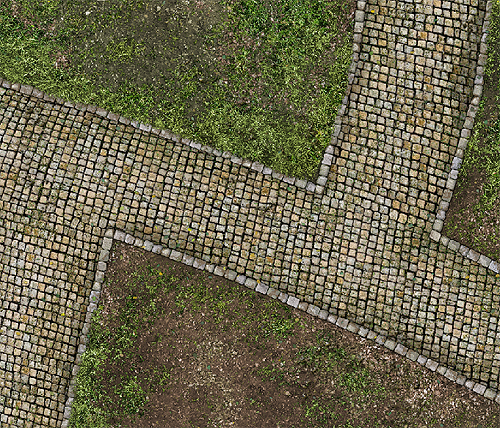 This map is specifically designed to offer something you can't get from modular tiles. It's a battle map, plain as that. And with that goal, I'm using the most versatile size for laying out the sheets with the least amount of paper waste, which is 7x10. It will work fine on both A4 and US letter sheets without anything cutting off. An 8" square has a chance of being cut off by the printer on an A4 sized sheet, since that page size is not much wider than 8". Yeah, that's odd. It's kind of an older set, isn't it? These days I'm pretty sure WWG would aim for a very gritty look to things. Thanks for the compliment, though! I like this set as it is for a small plaza/"square" in the middle of a city. 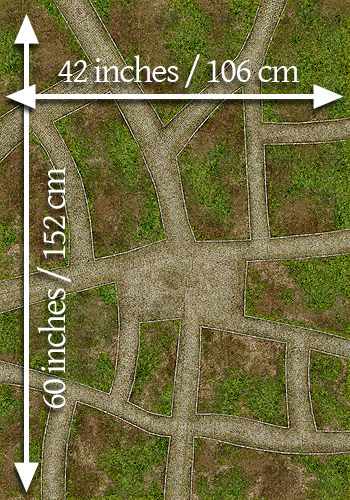 One would be a battle map depicting the road and web of alleyways that run just inside the city wall at one side, and the ground outside on the other. A person could build a model of the city wall running between the two sides. A road could be running in across the open side, and a gate house could be situated where the road would cross the wall. All sorts of interesting things can happen around a city gate! Another would be the main plaza in the middle of the town with a place for the city hall to one side of the square and a fountain in the middle. This reminds me of some of the urban fighting that took place during the Wars of the Roses! It's all coming together, Dave, it's ALL coming together! I see the point for 48"X48", but I would imagine that selectively reprinting pages from the set would allow for extensions to that width. I don't see a way to just recycle part of the ends. To create a battle map of this size, there will be a lot of material to be able to build a table of just about any size. As I look at your map, I already can imagine where the townhall, market and cathedral will be situated. I can see where shops, townhomes, etc. would be. 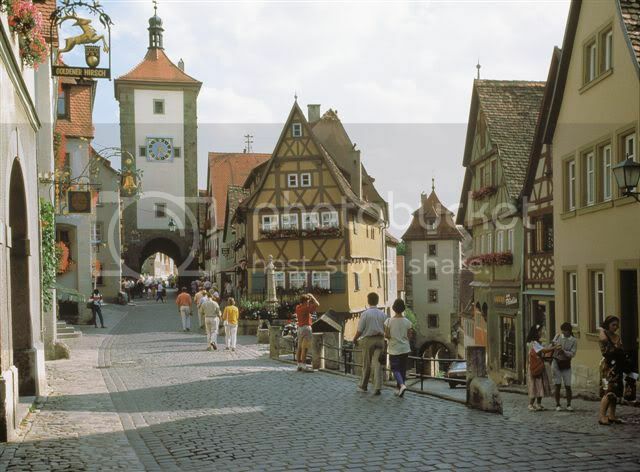 To me that tells me that you have captured the feel of the medieval town with your layout. Not even textured yet! Very nicely done. Steve posted while I was posting. The idea of a city wall demarking the area of expansion would definitely work. I don't know if you meant this, but one idea I pulled from your posts was "big tiles" -- maybe 18"x18". It's not right for what I'm working on now, but maybe something else down the line. Four 18x18 tiles would give you a decent play area, and each tile is big enough that I can build in a lot of irregularity. Each tile would require 6 sheets (A4/letter) without much paper waste. Is that a gold coin beside the grate? My players will scratch that off! Soft launch is under way. If you know where to look, you won't have to wait for the official announcement in order to download your copy. Hope you enjoy! This is a very beautiful map, dagobahdave. In any case I will not miss it ( and enough buildings to fill it ). But, sorry, this is fault of my own personal limitations, I don't understand why ( i love "only one big sheet" option ) 42"x60" ( 106x152 cm. ) and not 48"x72" ( 120x180 cm ). these, in fantasy wagames, are average measures for a big wargame ( www.games-workshop.com/gws/catalog/productDetail.jsp?catId=cat440008a∏Id=prod730814 ). This map is probably better-suited to RPGs and wargames with skirmish-sized forces, which are my preference (and my core audience, as far as I can tell). 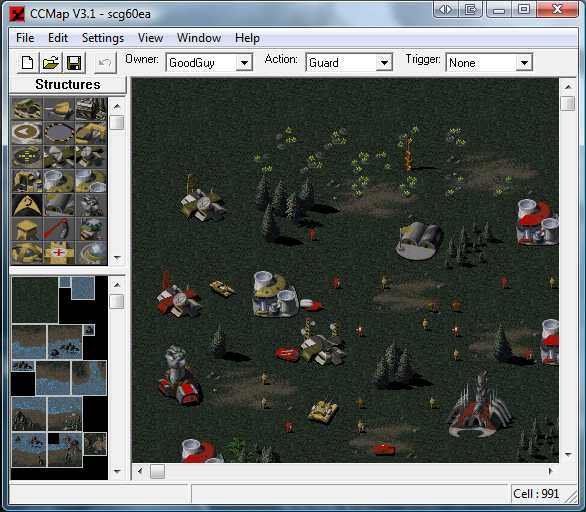 Once you fill up the empty lots with buildings, there won't be a lot of room left over for troops in formation, so you wouldn't be fielding 2000 point armies on this map anyway. You always have the option of asking your wide-format printer to expand the PDF to fit 48" which will stretch the length to about 69". 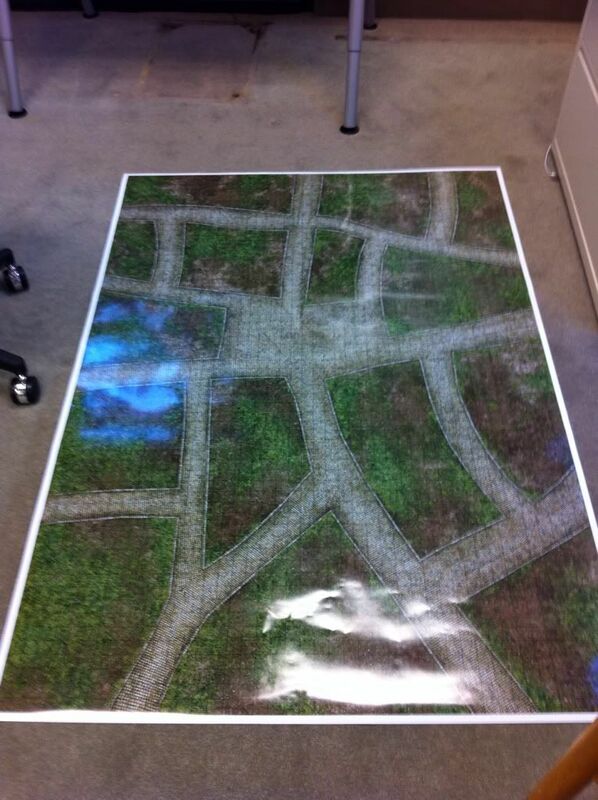 The grid won't be in scale then, so print the gridless version, and most wargames don't use a grid anyway. The difference in the visual scale won't be enough that it would bother anyone. Slightly wider streets would be better for big wargames anyway. Thanks for the info, by the way. 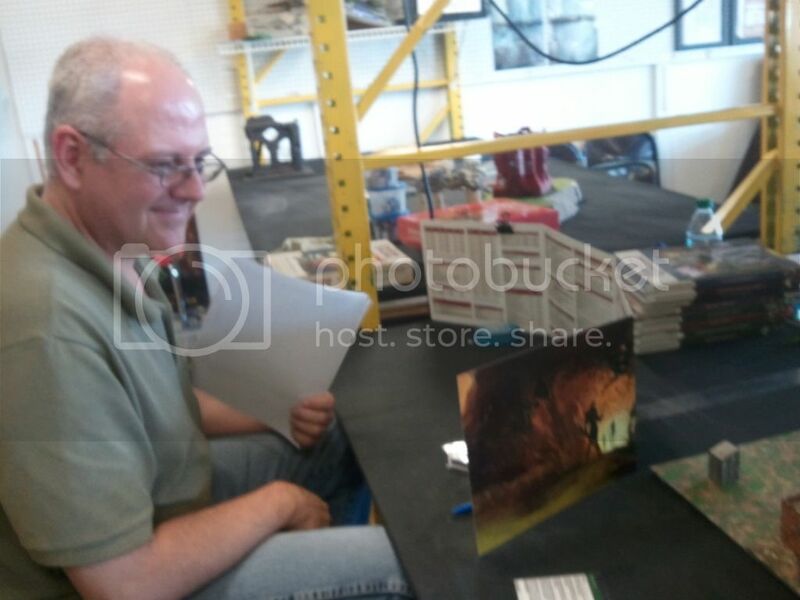 I see that a lot of players do prefer 4x6 foot tables. For the next map, I might try 48x80, with the option to shorten it to 70 inches. What do you think? And what kind of map would you guys like to see next? I'd like a coastal town map where one of the long columns was all water, the next column over would be the coastline transition with a small harbor. That way if I wanted an all water map I could just use those plain water tiles and connect the open ocean to the coastline. With a small harbor there should be room for some of the docks, quays, fishmongers, and warehouses that you've made. All the best adventures happen down on the docks just after moonrise. Oh! And the ability to connect your first map to the seacoast town map for a city expansion. This sounds like an awesome idea! 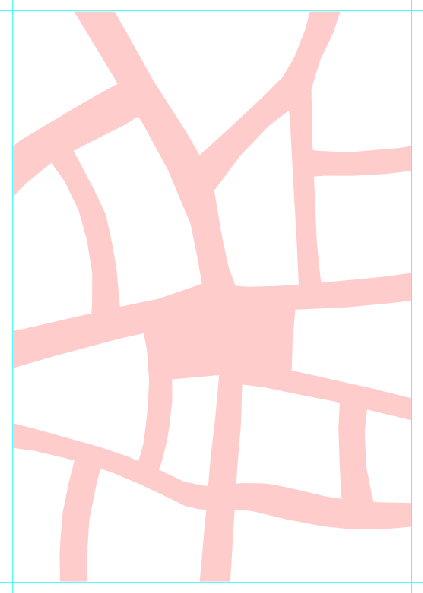 People would be able to create different map configurations depending on the sheets they print from each set. I have to be honest about the chances of this kind of stuff. I like the idea of linking maps, but this map was designed as a stand-alone project, and I don't have any graphics bleeding over the edges in order to properly extend it with a seamless match. I massaged, polished and treated these textures so much that I could never recreate the steps and get exactly the same look, and it would be tedious to even try. Interconnectivity between large maps really needs to be planned out in advance. In order to create a consistent look across them, a lot of the texturing has to be done for all of the maps involved before even the first map can be packaged up and put in the shop. That's going to be very labor-intensive, and the release rate will be slow. This 2D stuff is supposed to be relieving me of that for a while. Oh, and do NOT ask how much. This is the most expensive playmat I own, by far. Hey everyone. 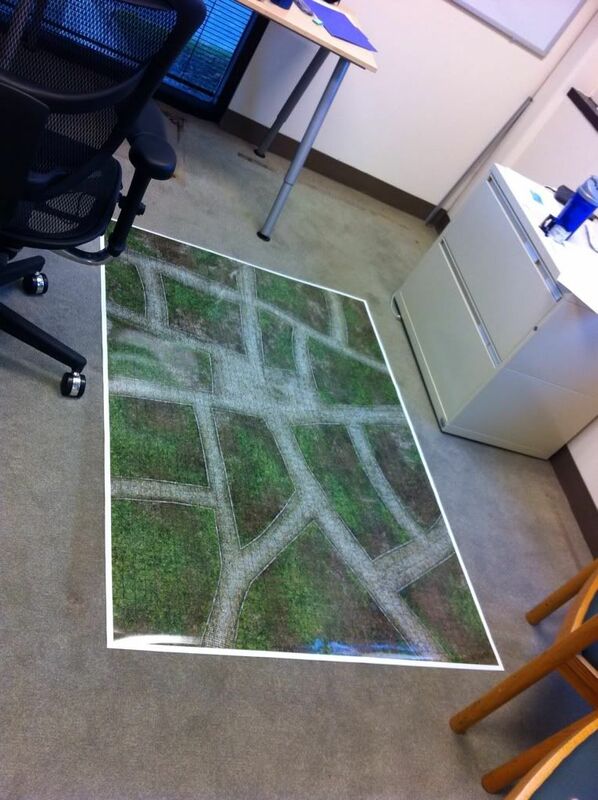 I'm new to the forums and after reading this thread I thought you all might like to look at my post over in the "Large maps - what size is most useful for you?" thread. I probably should have posted it here.